Last night we announced a big upgrade to Blogger Following, something we've been working on for months. I'm excited about this for a lot of reasons - but before I get to them, I want to address a couple concerns people have expressed on Twitter and on their blogs. Concern #1: I lost followers! I'm particularly sensitive to this concern - having run the publisher team at FeedBurner for years, I learned that publishers really care about their subscriber numbers, and any time a user's RSS subscriber number dropped without explanation it was cause for alarm. Numbers matter - a lot. For many, an important goal of their blog is to build a community around their content, and the number (of subscribers, followers, visitors, whatever) signifies for the publisher the scope of that community. Whether the number is 10 or 5,000, it's a number that becomes an easily digestible benchmark by which the success or failure of the blog is judged. Let's say Bill has a Blogger blog about his struggles with depression, and has "followed" three blogs covering the same topic. Bill's persona on Blogger is "public" insofar as it's discoverable and visible from those sites. But Bill isn't using his name - his profile simply identifies him as "DepressedInChicago". Separately, Bill has a Google account, through which he's joined his school alumni blog, a sports blog, and a tech networking site in Chicago. His Google account is his Gmail address, and he's well known within the tech and alumni circles in Chicago. By upgrading Blogger Following to leverage Friend Connect's community features, we had to make a choice: do we show off which sites Bill has joined (through Follow or Friend Connect)? If so, Bill's identity becomes obvious to the members of the depression blogs. And his struggles with depression become clear to his professional and personal colleagues. There are any number of examples where this blending of previously anonymous or pseudonymous activities through one persona with the more public activities of another persona could cause individuals great harm. Though the whole goal with Friend Connect is to make sites more social, we felt strongly that we could not risk any situation in which an individual's privacy was jeopardized. As a result, for those users who both followed a site with Blogger Following and joined a site with Friend Connect, we've defaulted those individuals to be privately following the sites they care about. Every one of these users is getting an e-mail from us explaining the situation, and will see an alert in their Blogger dashboard linking to the FAQ so that they can decide which (if any) sites they wish to follow publicly and which they wish to follow privately. While we recognize that this affects blogger owners (who saw their community's follower count drop), but hope that the reasoning behind the decision - not to mention the privacy concerns of the affected users - justified the path we chose. Edit the colors of the Follower widget. 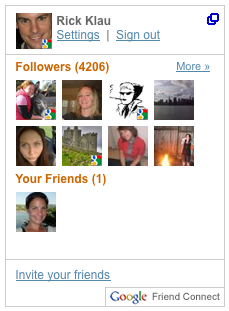 Go to "Layout" then find your Follower widget and click "Edit". You can modify the colors there, as soon as you click save the changes will be reflected on your blog. Remove the widget altogether. We don't want you to, but you of course can remove the followers widget if its presence distracts from the overall design of your site, or if it's breaking the layout in some way. If it is breaking, please let us know - in the comments to this post, on Twitter, via carrier pigeon... just make sure we're aware of the breakage and we'll get to work on fixing it. Wait. Like I said, we're working on making the presentation more flexible, more controllable by you. This is a high priority and we'll push the updates out as soon as we can. For many, an important goal of their blog is to build a community around their content. (I would appreciate it if you could avoid the urge to point out that quoting oneself - particularly in the same blog post - is bad form. Thanks.) Blogger Following was an immensely successful feature. Followers were growing by more than one follower per second, every second of the day. Clearly there was demand for this kind of visual representation of the blog's community - and Following, appearing on nearly 3 million blogs, was filling a need. But as successful as it was, it was somewhat limited. As a visitor to a blog with followers, I could see faces, but I couldn't really do anything with them. I couldn't interact with them, couldn't share with my friends on other services, and I had to be a Blogger.com account holder to follow a blog in the first place. For a whole host of reasons, following wasn't delivering on our vision for a more open, engaging community on every blog. Friend Connect inverts the old model: now anyone can follow a site, your audience gets increased visibility, and your followers get the opportunity to connect to each other instead of just to you/your site. Followers can now join using any of a variety of established IDs (Google account, AIM/Yahoo/Open ID) - gone is the requirement that followers need to be fellow Blogger users. Your followers are now a truer representation of your entire audience, not just your Blogger audience. Clicking on the face of a follower gives you the user's profile, including their own site as well as sites they've joined. Now your site can be a way for your followers to invite people back to their site, strengthening the connections among the members themselves and giving visitors a reason to join your site. In the end, I think that makes your site a more interesting destination for your community. As you might imagine, we have a number of things that we hope to build in the weeks and months to come that will leverage this community in new and more interesting ways. It's an exciting time, to be sure. But I don't want to down-play the concerns people have expressed so far - the feedback so far (good and bad) has been tremendously helpful. Keep it coming. I can recall at least a half dozen different explanations from people I respect who all explain Twitter in fundamentally different ways. And that, I now see, is part of its strength. It’s different things to different people: for some, it’s a way to “microblog” (i.e., say even more mundane things about even more discrete things in their day). For others, a way to send text messages to a group. Others see it as a way to carry on a group conversation. And still others see it as a way to keep tabs on what their friends are up to. Two years later, and that still mostly holds true. Ironically, at the time I thought it was going to be primarily an update tool for my blog. But now it's mostly a way to keep tabs on friends and, how did I put it? Right: "say even more mundane things about even more discrete things in [my] day." Yep, that sounds about right. But there's more to it, and two recent posts really capture a lot of what I think matters about Twitter. First, read Turk's piece on "What Twitter Is... To Me", and then read Erik Heels' post "How to be a millionaire on #Twitter". Both capture some of the less obvious benefits of a fast-growing community like Twitter. As for me, I follow far fewer people than follow me. I can't really fathom that there are 1800 people who care what I say, but that's another post for another day. I glance at new messages ("tweets", as they're called - and "tweets" is about the only made-up Twitter-ism I can stomach) using Tweetdeck a few times throughout the day, but miss much more than I catch. If I have a few minutes, I may scroll back and read more. I use Tweetdeck to monitor terms that matter (@blogger is by far the most important one), and will engage with people where I can help out. Another post that I'm going to write soon is how we've managed to use the "official" Blogger account on Twitter to good use. In the meantime, I'll simply point to Max Kalehoff's outstanding post on that subject a couple weeks ago.